To date, there have been a total of twenty-four members of The Temptations; the greatest rhythm and blues group of Motown Records’ golden era. But Ain’t Too Proud: The Life and Times of The Temptations is more like Otis Williams’ personal narrative. Williams, the only living original member, and the group’s founding father, as narrator, forcibly chronicles over fifty years of music history in just two and a half hours. Known for their precision, polish, and poise, the Temptations became a worldwide, highly successful, and mutigenerational brand with more than fourteen million in album sales, fourteen number 1 singles, and three Grammys. Inducted into the Grammy Hall of Fame and the Rock N’ Roll Hall of Fame, and with a star on the Hollywood Walk of Fame, Williams (Derrick Baskin) has much to be proud of, however, his long-winded narration takes away from a powerful story of true grit, sacrifice, and loss. Actors in musical theater can tell stories by creatively integrating song, dialogue, and dance, with lightening, set design, and props. Magic happens during productions when the audience is challenged to use its imagination. Imagination is everything to a successful theatrical production, believed Henri Ghéon, an early 20th century French playwright and critic. And as such, the audience does not have the opportunity to effectively use its imagination with this production. Playwright Dominique Morisseau wrote the show’s book based on Williams’ memoir but somehow under the direction of Des McAnuff the show comes across as a live audiobook presentation featuring the magical music of The Temptations. However, it is the classic Temptations’ musical catalog and a stellar group of talent that keep this show grooving and the audience dancing in their seats. Williams, who is always front and center as the storyteller, often gets lost in the background whenever Ephraim Sykes as David Ruffin and Jeremy Pope as Eddie Kendricks are performing. The play’s timeline, somewhat blurred, shows Ruffin painfully belting out “I Wish It Would Rain,” after we are told his girlfriend, singer Tammi Terrell has died at the tender age of 24. Sykes, sweaty and tearful, brilliantly shows us the vulnerability of an otherwise over-confident showman. And whenever Pope smiles and sings he captures the hearts of the ladies with his cute boyish looks and sweet soprano sound reminiscent of Kendricks himself. When the musical drops the narration for a moment, it creates a compelling scene. As the Temps revel in their ever growing fame on their way to the Deep South on the tour bus, lights go dark, angry racial epithets spew, sounds of bullets loudly fly, and the fear of God is felt by everyone in just 3 powerful minutes. No matter the stardom of the group or the fact they were adored by millions of fans, in those few moments the audience was effectively reminded that success isn’t easy, often comes with a price, and racism in America is very real. Even with a series of personal challenges and heartbreaking losses in The Temptations’ story, Sergio Trujillo adds some sunshine with his stellar choreography. Although dance moves are more modern and reflective of the later generation of Temps, they remain quite entertaining. At times, cast members appear to be simply showing off their individual dance skills than remain in sync with the others. The self –absorbed Ruffin often gets carried away, enjoying the attention while throwing up and catching his mike, sliding and splitting across the stage. In addition to their synchronized choreography, and perfect harmonies, the Temps were known for their meticulous style. Motown’s founder, Berry Gordy wanted this group to be seen as gentlemen. So when the Cadillacs, an American rock and roll group and Otis’ inspiration, appeared on stage early in the first act with their white dress suits and slick hairstyles, I was prepared for an array of classic Temptations threads. BUT that never happened. 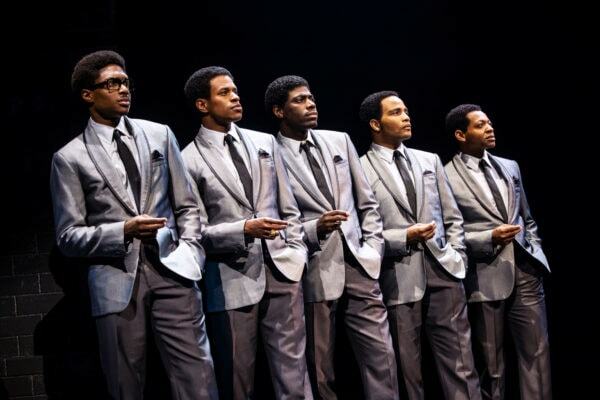 A good story keeps the audience engaged, enthralled, and wanting more; the Temptations story is a good one. But Otis doesn’t need to beg us to love this musical. We are proud to just be in the presence of this talented cast rewinding the music.